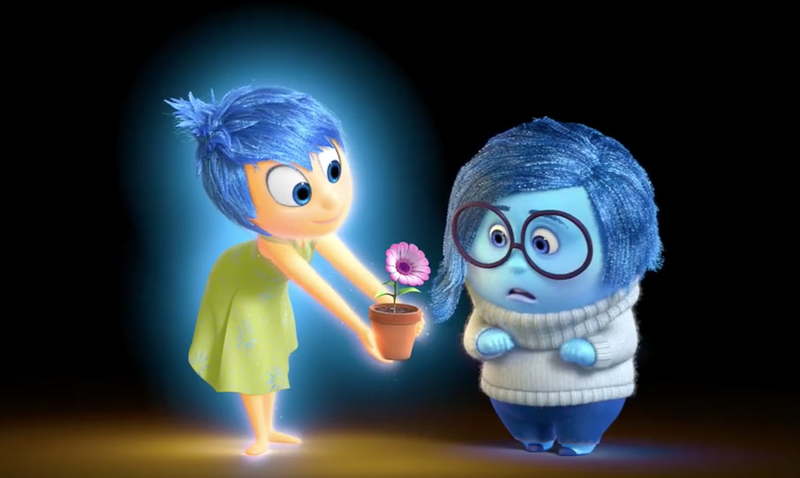 A new International Toolkit for Inside Out has just been released (via PixarInsideOut Tumblr), this one featuring Joy as her bubbly self trying to cheer up Sadness. While the clip is short in length the amount of detail that is shown is mind-blowing. The incredible animation showcasing the "squash and stretch" style really highlights the talent and versatility of the Pixar animators. If you look closely, you'll notice tiny glittery (pixie dust-like) particles fall from the duo as Joy happily bounces out of frame with Sadness in tow. It's the tiny details like this that make us drool with excitement and we can't wait to see more! The second International toolkit features the group dancing in a conga line formation, with Joy at the forefront and the group lagging behind. Updated - Feb 6 - an additional toolkit animation has been updated to the post. Earlier this month the first character toolkit (as seen below) was released on the Disney Channel featuring Joy and Fear (which we uploaded to our YouTube channel) - making us wonder if we will see clips with each character in the near future. Additionally, the previously released toolkit animations have also been added below for reference. Be sure to share your thoughts with us on the Pixar Post Forum and view more Inside Out images and videos in the Pixar Post Gallery.